You are asked to help kill a Vampire. Ring of Sunfire and gold, or if you killed Roland, you only get 250 gold. You are approached by Ralsa Norvalo who has a request for you to meet Seridur. Meet Seridur, and discover the Order of the Virtuous Blood. Accept your assignment, and proceed to Roland's House. Confront Roland with your intentions. Decide whether you'll kill him now, or listen to his story. If you chose to listen to his story, proceed to Phintias, and interrogate him. Learn of Memorial Cave, and fight your way through to Seridur. Dispatch Seridur, and return to the order for your reward. Once your Fame is 5 or greater, spend some time in the Temple District. A Dunmer woman, Ralsa Norvalo, will approach you to speak about a matter "of the utmost importance to the citizens of the Imperial City." She says her husband Gilen sent her to ask you to meet him at Seridur's house. Follow the quest marker to Seridur's house, located in the Imperial Temple district. Talk to Seridur and follow him into the cellar. He will present himself as the leader of The Order of the Virtuous Blood, an organization dedicated to hunting out and killing vampires. He will accuse Roland Jenseric of being a vampire and ask you to hunt down and kill him. He suggests that you search Roland's house for clues as to his whereabouts. Follow the quest marker to the accused's house and break in. As soon as you enter the house, there will be a table directly in front of you with three candles sitting in a bowl. On this table there will be a book with a small piece of paper on top, labeled "Love Letter from Relfina". Read the letter to receive a new map marker and Journal update. The letter mentions Roland Jenseric's cabin (the marker that was added to your map), east of the Imperial City in the Heartlands where the two lovers would meet. (While in Roland's house, you may want to visit the basement, too, for some insights into Roland's lifestyle!) You can go back to Seridur's house and speak with him before you head off to find Roland but he will just say that they cannot go with you as fighting isn't his specialty. You can alternatively proceed directly to Roland's cabin. Upon speaking with Roland he will tell you a different story. He tells you that Seridur is the real killer and vampire. It is up to you to believe or dismiss his story. If you decide to attack Roland he still proclaims his innocence and will not die without a fight. After you kill him, return to Seridur to receive a 250 gold reward. Afterwards, Seridur will dismiss you, end of quest. If you choose to hear Roland out, the quest continues. Roland will thank you for believing in him and refer you to Phintias, owner of the First Edition book store in the Imperial Market District. Talk to Phintias and if his disposition is high enough (60+) he'll tell you Seridur comes in occasionally and buys books and that he once overheard Seridur mention the Memorial Cave just outside of the Imperial City. Phintias will mark the location on your map; travel there to continue the quest. The cave is inhabited by vampires, undead, and timber wolves. Search the cave for Seridur (you'll spot the green quest marker after you travel in a bit), killing all who stand in your way or using stealth to bypass them. There is a chance you can contract Porphyric Hemophilia so be sure to get it cured if you want to avoid becoming a vampire yourself. When you meet up with Seridur he will tell you that you were too nosy for your own good and attack you. His speed is extremely high and he can be a real challenge for a low level character, so use caution when confronting him. Dispose of him, loot his body, and return to Roland's cabin. Roland will be overjoyed and says that he will carry on as the leader of the Order of the Virtuous Blood. He will tell you to meet him at the now-departed Seridur's house where the order meets. 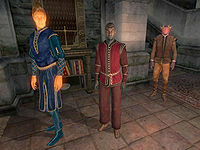 Members of the Order of the Virtuous Blood apologize to you for not suspecting that Seridur was the real vampire, as he was a highly-respected member of Imperial society. Roland will give you the leveled Ring of Sunfire (with Resist Disease and Reflect Spell). Roland will also make you an honorary member of The Order of the Virtuous Blood. Also, for every vampire dust you bring in, he will pay you 250 gold; this offer holds for the rest of the game (see Vampire Dust for details on which types of vampire dust actually qualify for the bonus). Doing this quest while a vampire, even in the fourth stage of vampirism, will not make any significant difference to this quest. Since Seridur is both an Altmer and a vampire he is extremely vulnerable to fire and will go down rather quickly if you use a decent flame spell or enchantment. After the quest is completed by killing Seridur, slaying Roland will result in a quest update saying: "I've slain Roland Jenseric, I should return to the Order and tell Seridur that my task is completed". If you approach Ralsa Norvalo in her house to start this quest, it is possible for the door to be locked after you complete the conversation. If this happens, you need to Sneak to the door to unlock it (if she sees you you'll be reported). If you kill Seridur and loot his body, he won't have any vampire dust on him. Interestingly enough, Seridur does not belong to the Vampire or Undead factions. This means that the undead inhabitants of Memorial Cave are likely to attack him on sight. Seridur will generally win these fights, although he may take considerable damage. At higher levels, the leveled list may spawn Nether Liches, which will generally kill Seridur should they encounter him (The quest will still update if he is killed by undead). Killing Seridur before his final speech in Memorial Cave will count as murder. ? It is possible to start this quest without any fame at all. Start the quest Canvas the Castle, then go talk to Ralsa Norvalo. She will then ask you to reconsider as if she had asked you before. The quest dialog option is then available. If you kill Roland Jenseric without first talking to him to receive the quest update to stage 70, the quest will fail to advance past stage 60 and cannot be completed. If you keep giving Roland vampire dust too many at a time, the right amount will be removed, but you will not receive the correct amount of gold. ? 5 A Dunmer named Ralsa Norvalo has approached me in the Imperial City Temple District and asked me to meet her husband Gilen. I refused for now, and she told me if I change my mind, to come to her house where she'll fill me in on all of the details. 10 A Dunmer named Ralsa Norvalo has approached me, and said that her husband needs assistance in a matter of what she calls "the utmost importance to the safety of the citizens of the Imperial City". She told me to meet Gilen at the house of someone named Seridur. Apparently, all will be explained when I get there. 20 Seridur has revealed to me that he's a member of a group of individuals dedicated to the destruction of vampires called The Order of the Virtuous Blood. Their goal is to keep the Imperial City safe from these creatures of the night. I should continue speaking to him and find out how I can assist them. 30 I've been told that Roland Jenseric here in the Temple District of the Imperial City is a vampire. The Order would like me to kill him. 40 To locate Roland Jenseric, Seridur suggested I search his home, which is also here in the Temple District. 45 I've arrived at Roland Jenseric's house. I should begin to search the place for any clues as to his whereabouts. 50 After searching Roland's home, I've found a letter written to Roland from his girlfriend. It mentions a cabin where the two would meet. It's located east of the Imperial City in the Great Forest. I think this may be where Roland could be hiding. I should head out there immediately before he has a chance to escape. 60 I've arrived at Roland's cabin. I should proceed inside to see if he's here. I should be cautious, as Seridur warned me that vampires could be very dangerous. 70 Roland Jenseric insists that he's not a vampire. In fact, he's accusing Seridur of being one instead! I should listen to what he has to say about Seridur and see if I can determine who's telling the truth. 80 Roland tells me that he thought his lover was having an affair, so he followed her one night on a walk. He came across Seridur draining the blood from her neck. Roland says he attacked Seridur, and in the chaos, Roland's lover was killed. Seridur got away. Knowing Selidur [sic] was a respected member of the Imperial City, he panicked and ran to the cabin here to collect his thoughts and decide what to do next. I need to decide what to do about this. 82 I've stayed my hand, and will let Roland live for now. 84 I've decided to give Roland a chance, and will investigate his story. Roland told me that Seridur makes the occasional trip to the First Edition bookshop in the Market District of the Imperial City. He told me I should speak to the owner, Phintias. 85 I've discovered that Seridur makes the occasional visit to a place called Memorial Cave. It's a burial site for many heroes that died in past wars. Seridur supposedly has a relative interred there. Perhaps I should go investigate. 90 I've entered Memorial Cave. It's now being used as a vampire den. I need to see if I can find Seridur in here and put a stop to his charade. 100 I've slain Seridur. I should return immediately to Roland's cabin and give him the news. 110 I've returned to Roland's cabin and told him what had transpired. He thanked me for clearing his name, and vowed to take Seridur's place to continue the Order of the Virtuous Blood. He said I should meet him there for a reward. 150 I've slain Roland Jenseric. I should return to the Order and tell Seridur that my task is completed. 160 Yes Seridur was pleased with me, and rewarded me with 250 gold. He said that I've done a great service for the Imperial City and I should be proud. 200 Yes I've returned to Seridur's home, which the Order still uses to meet. Roland was there, and he told me I am now an honorary member of their group. He has also bestowed an enchanted ring on me to help me in my future encounters with vampires. 250 Yes One of the characters needed to complete this quest has died. It is possible to use the console to advance through the quest by entering setstage MS23 stage, where stage is the number of the stage you wish to complete. It is not possible to un-complete (i.e. go back) quest stages. See SetStage for more information.